From playing gangmembers and Māori elders to impersonating Winston Peters, Rawiri Paratene has won a reputation for the versatility of his acting. But the versatility does not end on screen — Paratene has also directed for radio and screen, won a Robert Burns Fellowship for his writing, taught drama, and spent time as deputy chair of the New Zealand Film Commission. At school Paratene initially struggled at reading and writing, but after leaving high school went on to become the first Māori student to graduate from the New Zealand Drama School. His hope was that acting would help his development as a writer. Earlier, at the age of 16, Paratene had halted a promising rugby career in protest at the 1970 All Black tour of South Africa. He joined Māori youth movement Ngā Tamatoa at high school, and later became president of the Wellington branch (later he presented this 2012 documentary on the organisation). Paratene had a small part in historical TV epic The Governor. Aged 21, he won a starring role in early Kiwi sitcom Joe and Koro (1977). The chalk and cheese tale followed two flatmates: a university educated Englishman, and a young Māori who works in a chip shop. Amidst an extensive run of acting for stage and radio, Paratene later began a six-year stint on longrunning pre-school show Play School. He is still recognised for it today. In 1983 Paratene won a Burns writing fellowship at Otago University. A number of the projects worked on in this period would later find their way to television screens, including the drama Erua, and hour-long Montana Sunday Theatre piece Dead Certs. (has role as a racing addict would later win him an award). Erua, the tale of a relationship between artist Toss Woollaston (Grant Tilly) and a Māori boy, won him 1989's NZ Television award for best drama writer. Two years later he both wrote and acted in Opo, which mixed dramatised sequences with memories of those who had encountered the famous the dolphin back in 1955. Paratene's big screen career began in the mid-80s. In underrated romance Arriving Tuesday (1986) he plays the poet/musician Riki, who spends time on a hikoi. The movie was filmed partly in the Hokianga, for many years Paratene's home base. He also voiced the character of Rangi in animated hit Footrot Flats: The Dog's (Tail) Tale. The 90s saw Paratene winning attention on the comedy front. After the makers of shortlived skit show Laughinz came to him in search of material, Paratene gave them the fast-talking Hohepa Public, a Hokianga bushman who Paratene described as "a blatantly political character". 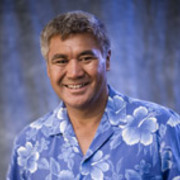 The showstealing Hohepa monologues saw him invited to join skit show Issues. Paratene would appear in five series, alongside David McPhail, Jon Gadsby, Rima Te Waita, and Mark Wright. But it would be two later roles that cemented Paratene's place in New Zealand screen history. In 1999 he played Mulla, the gangmember trying to go straight in Once Were Warriors sequel What Becomes of the Broken Hearted? Some scenes required seven hour make-up sessions, as fake tattoos were applied to much of Paratene's body. His director was Dead Certs collaborator and mentor Ian Mune. According to Paratene, a childhood spent partly in South Auckland meant he had some familiarity with the world portrayed on film. In 2003 Paratene travelled to film festivals around the world to publicise the hugely-successful Whale Rider, in which he plays fiercely traditional grandfather to Keisha Castle-Hughes's Pai. "I don't believe I've ever wanted a role as much as Koro," said Paratene. "Koro is absolutely honest to his tikanga - his understanding of Māori culture and customs. But with that honesty comes stubbornness and pride, and that's what trips him up." Paratene's directing career had began back in the late 80s, with Te Moemoea, an episode in Māori anthology series E Tipu e Rea. It was based on a Patricia Grace short story about a rural couple who are inspired to place horseracing bets after a dream. Unusually it was made entirely in te reo Māori, and similcast on National Radio in English. Paratene wrote another episode in the E Tipu e Rea series: Variations on a Theme is based partly on his own school experiences, and deals with issues of Māori education. Paratene has also directed on language learning programmes Korero Mai and Whānau; a documentary on a New Zealand visit by Kiri Te Kanawa, and (with Miranda Harcourt) 1940s-set drama school short Needles and Glass. In the 90s, he spent four years as deputy chairman of the NZ Film Commission, and later relocated to Wellington to do three years teaching at drama school Toi Whakaari. Later he completed a fellowship at England's prestigious Globe Theatre, and went on to tour the world as part of a Globe production of Hamlet, the play which first helped convince him to become an actor and writer. Another personal highlight is Children of the Sea, which began as a series of theatre workshops in Sri Lanka for survivors of tsunami and civil war. The play won four awards at the 2005 Edinburgh Festival. He also appeared in Kiwi drama Jinx Sisters, and in 2008 won a NZ Film and Television Award for best actor, after starring in short film The Graffiti of Mr Tupaia. Docu-drama What Really Happened: Waitangi saw Paratene playing Ngā Puhi chief Te Kemera Kaiteke, uncle to Hone Heke. Paratene has also done acting stints on soap Shortland Street, and appeared in episodes of Mataku, Duggan and Xena: Warrior Princess, plus mockumentary Love Mussel (2001). His writing work includes hit musical Blue Smoke, and radio play The Proper Channels, which won him a Mobil Radio Award. September 2010 saw Paratene winning acclaim for his starring role in passion project The Insatiable Moon. Paratene had been attached to the project for many years. As Metro reviewer Graham Adams put it, the actor plays a "barefoot, messianic Arthur, glowing with goodness as the self-proclaimed second son of God"; Adams found the performance convincing and compelling. Paratene went on to win the 2011 Aotearoa Film Award for Best Lead Actor for the role. At the close of 2012 he was made an Officer of the New Zealand Merit. The award noted his contributions across film, television and theatre.